Two days ago we heard that AMD is preparing two new Fiji based graphics card for Computex in June. The R9 390X and R9 395X2. With the 390X slated to become the new single-GPU flagship from the company and the 395X2 taking the torch from the R9 295X2 as the new dual-GPU flagship. Yesterday Tweaktown stated that they’ve heard rumors which suggest that these new GPUs while very exciting could end up quite exclusive with a limited number of units initially. Due to HBM still ramping up in production. We have known for quite a while that AMD would end up using this new memory standard for its next generation graphics chip for quite sometime. The memory standard was co-developed by AMD and SK Hynix and promises to offer 450% the bandwidth of GDDR5 chips in its first generation and 900% the bandwidth of GDDR5 in its second generation. HBM is an entirely new memory spec and will only debut for the first time this year. However, its introduction will be a huge milestone as the technology will be a cornerstone feature in a high volume consumer product, Fiji. So this is a big deal for SK Hynix who manufacture the memory chips. If the memory’s introduction to the market turns out to be a graceful one it would instill huge confidence in Hynix’s ability to deliver. And would encourage other companies to use the new memory technology, driving yield up and cost down for everyone. However it’s not really surprising that HBM would begin selling in limited quantities. As stated above it’s really a huge challenge to introduce an entirely new spec with a high volume product. But it seems both AMD and Hynix are willing to take on that challenge. Which should pave the way for even higher volume products featuring the new memory spec to follow suit. Nvidia announced that it would start using the technology once the second generation is introduced, which will be next year in all likelihood. Hynix recently showcased a sample of the HBM1 memory it’s shipping right now and a wafer of HBM2 to prove that the technology is progressing smoothly. Going back to Fiji and the R9 390 series. Some sites have speculated on how Fiji XT would perform in comparison to the GTX Titan X. We have to make it plain that it’s extremely difficult to predict how the chip would perform precisely. This because HBM really is a wild card in the performance equation for FIji. We can’t yet quantify how much of a performance improvement having this much memory bandwidth would yield. However I will attempt to draw a conservative estimate of what the performance of the GPU will look like based on the leaked specifications of the chip. I will leave out any possible performance improvements that the new memory sub-system could show and also negate any possible architectural improvements because we can’t quantify these two items yet. The estimate will solely be based on the leaked number of stream processors and clock speed. So the actual performance figures should end up higher than our estimation if the leaked specifications are fairly accurate, which we believe them to be. 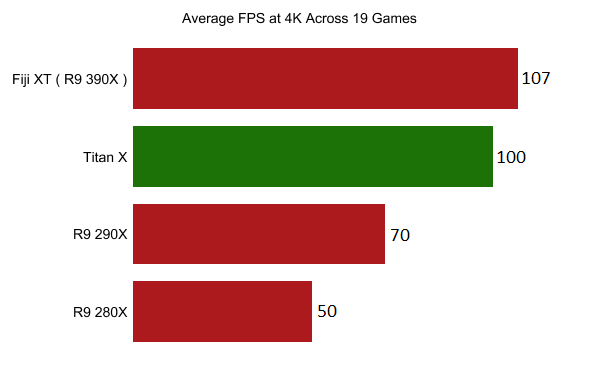 Our estimation is based on the average FPS figures across 19 different games tested by TPU in their review of the Titan X. 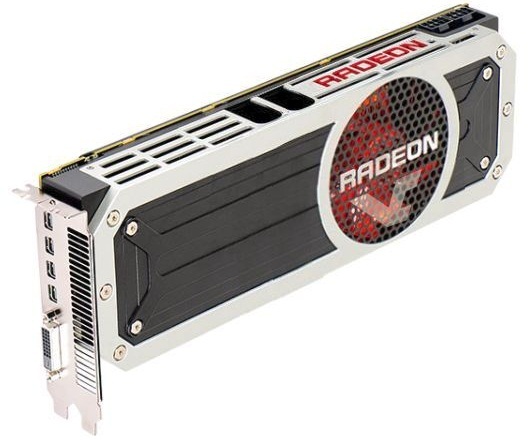 At 4K the performance of AMD’s GCN based GPUs scales in perfect linearity. For example the 2560 GCN unit R9 290 was precisely 2.0x faster than the 1280 GCN unit HD 7870. Even though the 290 is clocked slightly below the 7870, so this would account for the architectural improvements that AMD introduced with the Volcanic Islands architecture verses the Southern Islands architecture. The performance estimate below is based on scaling with the number of stream processors / GCN units of Fiji XT vs Hawaii XT but again this does not account for any potential architectural improvements or potential HBM memory bandwidth benefits. [spoiler title=”Awesome Math”]#1 Dividing the number of stream processors of Fiji by the number of stream processors of Hawaii, trusting that the performance will scale perfectly with each additional SP based on the scaling we observed with the R9 290 vs 7870 data. #2 Then multiplying the result by Fiji’s clock speed, which is purported to be 1050Mhz vs 1000Mhz for Hawaii. Which makes Fiji’s clock speed 1.05 that of Hawaii. I have to point out that two conditions have to be fulfilled for Fiji to match this estimation. #1 It must actually have 4096 Stream processors and #2 A 1050Mhz GPU clock speed. The results are very interesting because remember the GTX 980 Ti is rumored to feature a bump in clock speeds verses the Titan X. Nvidia will also allow AIBs to sell custom cooled and overclocked versions of the card so we’re bound to see GTX 980 Ti cards that perform similarly to the Titan X. But even without knowing the performance advantage HBM or the updated architecture of Fiji may bring to the table we can tell that it’s going to be an interesting match-up between the 390X and the 980 Ti. We’ll continue to follow the scene very closely and bring you updates on both new flagships as soon as we can, so stay tuned.